Monitors are getting increasingly diverse these days. It’s not just a simple choice of picking from among three-panel types anymore. There are now proprietary hardware and software features which should be considered based on what you are going to be doing with your monitor. You might want a monitor just for watching movies or maybe you want to play competitive video games or perhaps you want something good enough to edit professional quality photographs. There are a multitude of reasons and a multitude of display options for them all, here’s what you need to look at before buying your next monitor. Panel types – The most common panel type in the market, TN panels are as old as commercially viable LCD technology itself. If your TV manufacturer hasn’t listed out some exotic technology underpinning the panel, chances are it’s the good ol’ TN panel. Because of this panel type’s simplicity and the fact that it has existed for donkey’s years, this allows it to be ubiquitous due to cheaper manufacturing cost. However, low cost isn’t its only trick. TN panels are by far the quickest when it comes to response time. That is, the pixels within this panel are capable of changing their state quickly and thereby reduce motion artefacts such as blur. That’s why nearly all gaming monitors that support some sort of high refresh rate technology happen to be TN panels. Monitors that also incorporate active LCD shutter based 3D support usually employ TN panels because the 3D implementation requires monitors capable of frame rates upwards of 120 Hz. Modern TN panels catering to gamers promise better motion handling and smoother experience by incorporating true 144 Hz refresh rates. This isn’t meant for 3D implementation, but to offer a fluid gameplay experience for FPS gamers, where faster screen refreshes make the difference between a frag and getting fragged. It’s cheap, fast, and perfect for gaming, so what’s the catch, you ask. Well, the prime weakness of this panel tragically happens to be picture quality. In short, choose TN panels only if you value 3D and gaming over colour accuracy. These are definitely not the kind of panels you choose for colour accurate web designing, video production, and photo manipulation purposes. If TN is at one end of the LCD quality spectrum, IPS (In-Plane Switching) panels lie at the very extreme. Nothing beats this technology when it comes to absolute picture quality. It delivers the trifecta of image quality, colour accuracy, and viewing angles, thereby making it indispensable for colour accurate work such as web/graphics design and photo/video editing. As expected, these monitors also happen to be at the higher end of the price spectrum. But for the money, you get sharp, crisp picture with vibrant colour reproduction and viewing angles as wide as 178 degrees. In fact, IPS panels are the way to go if you’re looking for a larger display meant to accommodate more than one viewer. Pricey IPS panels may offer much higher image fidelity than TN panels, but the technology still has its Achilles heel. The response time of this technology is the slowest of the lot and ranges from 6 ms to 16 ms depending upon how deep your pockets can go. Make no mistake, this is only a tad bit slower than the average TN panel and not even noticeable in day to day usage. However, slower response time can be telling in video games. If you’re an FPS gamer who’s particular about image quality, you might want to choose IPS panels that deliver a response time of 8 ms or lower. Dig deeper into the IPS hierarchy and you’ll find further subdivisions that are differentiated by their inherent pixel structure. Each variant has its own pros and cons, wherein parameters such as colour accuracy, contrast, and black levels vary according to the technology employed. S-IPS panels, for example, cost a premium and can be identified by the presence of a purple hue on blacks, when the screen is viewed from chronically acute angles. The cost factor makes these IPS type not as widespread. This is especially true of the more modern H-IPS panels, which incorporate a pixel structure that leads to improved contrast ratios and finer pixel pitch for improved image quality. Most affordable IPS panels, however, are e-IPS that are pretty decent image quality wise, but only offer 6-bit colour depth. This is rarely an issue considering modern video processing hardware does a pretty good job at FRC/dithering to achieve true colour output despite the 6-bit panel limitation. H-IPS and S-IPS panels with true 8-bit panels are usually necessary for the prohibitively expensive colour accurate monitors for professionals. Vertical Alignment (VA) panels lie somewhere in the middle of the cost/quality spectrum of LCD displays. This panel type is further sub-divided into S-PVA/MVA and offers significantly better colour as well as generous viewing angles when compared to TN panels. Again, like the IPS panels, VA panels tend to have slower response times. Since this technology is more or less similar to S-IPS, it also faces the same problems. Even though VA panels deliver great colour performance and wide viewing angles, it’s still not as good as IPS panels. To make matters worse, the response times are worse when compared to IPS. These panels are definitely not the right fit for gamers, because they tend to add palpable input lag as well. On the flip side, VA panels tend to offer better blacks even when compared to IPS due to their inherently better contrast ratios. Unfortunately, the performance isn’t as balanced because these panels are marred by serious colour shift issues, which also lead to annoying brightness levels across the width, especially when viewing even from a slightly off centre angle. What’s more, even the central viewing position isn’t immune to issues. Colour shifts tend to cause reduced darker details in dark scenes, even when viewed directly from the centre. While some users aren’t sensitive to these colour shifts and uneven brightness, but still others deem it a deal-breaking issue. Thankfully the proliferation of cost-effective IPS panels means that VA technology has more or less been edged out. You’re better off avoiding monitors with these panels since you’re likely to find a good IPS alternative at roughly the same price range. LED-backlit LCDs are doing great in the computer monitor space, but once you enter the realm of larger screens, it opens up the market for OLED alternatives. The sublime plasma technology may be dead, but its throne is taken over by another capable emissive alternative that is OLED, which fills in the gaps left behind by LED displays. What follows is an overview of how the emissive OLED displays trump transmissive LED panels in crucial picture quality parameters. Rich colours – Colours in LCD panels are limited by their rather convoluted means of colour reproduction. These displays essentially use liquid-crystal filters to block and bend light to create different colours. This isn’t the most foolproof or efficient means of creating colours and is marred further by optical anomalies that compromise colour fidelity. On the other hand, every individual pixel in an OLED panel generates accurate colours by exciting the phosphors to emit light of desired colour. Since this approach is similar to that of CRT TVs, OLEDs are better at producing excellent contrast levels and rendering accurate colours with rich saturation. Better blacks – Being emissive displays, OLED doesn’t require backlighting, which is the primary cause of black crush, or the inability to render black detail in LED panels. OLEDs can achieve perfect black levels because these panels can switch individual pixels off completely. The lack of a backlight fouling with pixels that are supposed to be darkened, affords much better black detail. Full-matrix backlit LED panels advertised as locally-dimmed panels try to get around this problem, but they end up introducing the distracting halo effect in the darker scenes. No backlight bleed – Backlight bleed, as the name suggests, is a typical problem faced by transmissive displays such as LCDs and LED-backlit LCDs. 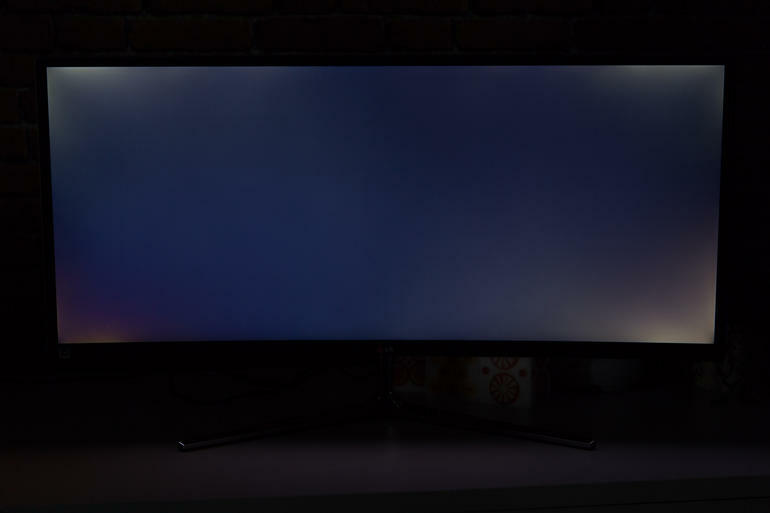 Conspicuous bright and dark spots spread randomly across the panel are tell-tale signs of this phenomenon affecting virtually all LED televisions. Such bleeding affects colour and picture uniformity and is caused by a range of factors ranging from imperfect backlight diffusion panels to chassis deformation. Since backlight bleed is linked to material and build quality, it is less prevalent in high-end LED panels. But because it affects cheaper displays the worst, it makes their already poor grey-scale performance end up looking even worse off. OLED panels, on the other hand, don’t suffer from these gremlins. These emissive panels don’t have to bother with backlights and complicated diffusion panels like LCD panels, thereby making them completely immune to these issues. Faster response time – LCD displays have a much slower pixel response time as compared to OLEDs, which are ten times as fast as conventional LED displays. Pixel response time represents the delay in transitioning from grey to black and white to black states by individual pixels. LEDs are marked by slow response times because the liquid crystals are reconfigured by electrical stimulation to modulate the backlight. The pixels are slow to refresh because the liquid crystals can’t change states fast enough, thereby causing fast moving images to appear blurred to the human eye. Slow response time can be an issue if you watch a lot of sports, action movies, or play video games. Spend more on LED televisions and you’ll find fancier models that employ electronic wizardries such as backlight scanning, higher refresh rates, frame interpolation, and pixel overdrive to mitigate the issue. Interestingly, these can also be applied to OLEDs for even better blur reduction. Better viewing angles – Compared to OLED panels, LEDs are significantly more complicated. This complex design also results in the optimal viewing angle being restricted to a narrow sweet spot directly in front of the display. That’s because transmissive LCD panels pass light through various layers of colour and polarising filters in addition to a liquid crystal layer that block, bend, and vary the intensity of light to produce images. It’s the resulting gap between the backlight and the various layers that introduces colour shift and other picture quality imperfections when viewed from extreme angles. Newer LCD technologies such as IPS panels have greatly improved off-axis screen performance, but nothing comes close to the viewing angles achieved by OLEDs. Because these panels emit light – as opposed to LEDs blocking it – they offer excellent off-axis performance, with virtually no colour and gamma uniformity issues even when viewed from extremely acute angles. Thus far we have seen the rather severe limitations posed by LED-backlit LCD panels and how OLEDs fill in these gaps with excellent picture quality and performance. However, no display technology is perfect and OLEDs also have teething troubles and minor niggles. In the next instalment, we will take a look at these OLED-specific issues and, more importantly, how premium LEDs strike back with quantum dot technology that promises to deliver emissive-like performance in the existing transmissive technology. Resolution – Resolution has different ramifications depending upon the type of application. IPS Monitors generally ship in wider screen size variation with generous resolutions such as 2560 x 1440 instead of 1920 x 1080 for 27-inch models and 2560 x 1600 for 30-inch models. But before you make that sort of commitment, make sure that your gaming rig is good enough to handle the extra load. As a thumb rule, Full HD resolution is good enough for TV usage. However, with the PC you are only limited by your graphics card and CPU. Games can easily be rendered in 4K and most streaming services are now pushing 4K content. So investing in a 4K display is prudent but not necessary. You can still make do with Full HD for a couple of years easily. Ports – HDMI is the de facto standard and Display Port inputs as well. These are foolproof means to get signal from your PC because the DRM-addled nature of the HDMI standard means that certain content cannot pass through HDMI but that’s only if you are going to be using your monitor for watching TV content as well. USB passthrough is a wonderful convenience if it exists, however, if not implemented properly, you will have interference which really wrecks your experience. VGA is a dying standard, so if your panel doesn’t have one, then it’s absolutely fine. Fancy lighting – Yes, the same old RGB. There’s no point in considering that when going in for a new monitor as it is a purely cosmetic feature.